Simple. Inspirational. Complete. This book covers it all! Do you desire to see God working more profoundly in your life? Are you physically in need of relief? The treasures found in this book will open up the benefits experienced by Daniel both spiritually and physically. • Planning Tips - A 21-day complete menu plan, comprehensive shopping list, plus tips to get started. • Recipes - Over 45 beautifully photographed recipes guaranteed to become family favorites. • Inspiring Devotionals -Quick-read uplifting daily devotions. Taste the discipline of the Daniel Fast, enjoy the nutritious recipes and experience a deeper intimacy with the Lord that will encourage you to make the this an annual event. It is clear the spiritual and physical go hand-in-hand. In the Old Testament Esther called for her people to fast within a moment's notice. Daniel fasted as if his life depended on it. Today we find ourselves in situations similar to Daniel and Esther and the same benefits of fasting are available to us as well. 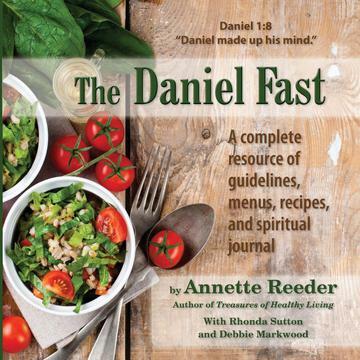 Annette Reeder, A Biblical Nutritionist, has laid out a simple, nutritious and organized plan for your spiritual and physical enjoyment from the Daniel Fast. This Daniel Fast book will give the tools needed to make the planning and tasting simple and organized.